China-based companies show the largest fabless IC marketshare gain since 2010. March 22, 2018 -- Research included in the March Update to the 2018 edition of IC Insights’ McClean Report shows that fabless IC suppliers accounted for 27% of the world’s IC sales in 2017—an increase from 18% ten years earlier in 2007. As the name implies, fabless IC companies do not operate an IC fabrication facility of their own. 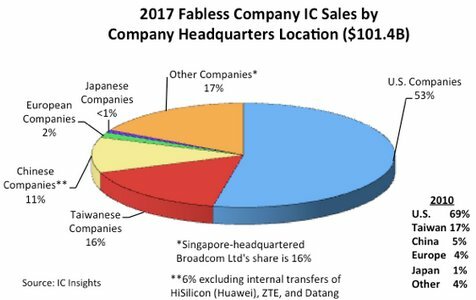 Figure 1 shows the 2017 fabless company share of IC sales by company headquarters location. At 53%, U.S. companies accounted for the greatest share of fabless IC sales last year, although this share was down from 69% in 2010 (due in part to the acquisition of U.S.-based Broadcom by Singapore-based Avago). Broadcom Limited currently describes itself as a “co-headquartered” company with its headquarters in San Jose, California and Singapore, but it is in the process of establishing its headquarters entirely in the U.S. Once this takes place, the U.S. share of the fabless companies IC sales will again be about 69%. Taiwan captured 16% share of total fabless company IC sales in 2017, about the same percentage that it held in 2010. MediaTek, Novatek, and Realtek each had more than $1.0 billion in IC sales last year and each was ranked among the top-20 largest fabless IC companies. China is playing a bigger role in the fabless IC market. Since 2010, the largest fabless IC marketshare increase has come from the Chinese suppliers, which captured 5% share in 2010 but represented 11% of total fabless IC sales in 2017. 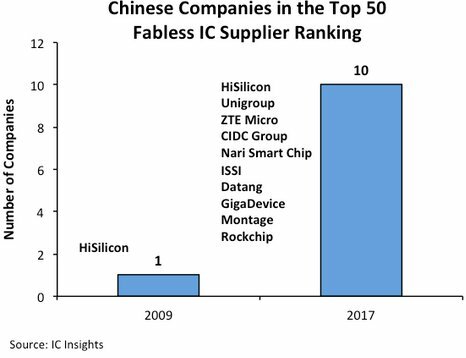 Figure 2 shows that 10 Chinese fabless companies were included in the top-50 fabless IC supplier list in 2017 compared to only one company in 2009. Unigroup was the largest Chinese fabless IC supplier (and ninth-largest global fabless supplier) in 2017 with sales of $2.1 billion. It is worth noting that when excluding the internal transfers of HiSilicon (over 90% of its sales go to its parent company Huawei), ZTE, and Datang, the Chinese share of the fabless market drops to about 6%. European companies held only 2% of the fabless IC company marketshare in 2017 as compared to 4% in 2010. The loss of share was due to the acquisition of U.K.-based CSR, the second-largest European fabless IC supplier, by U.S.-based Qualcomm in 1Q15 and the purchase of Germany-based Lantiq, the third-largest European fabless IC supplier, by Intel in 2Q15. These acquisitions left U.K.-based Dialog ($1.4 billion in sales in 2017) and Norway-based Nordic ($236 million in sales in 2017) as the only two European-based fabless IC suppliers to make the list of top-50 fabless IC suppliers last year. The fabless IC business model is not so prominent in Japan or in South Korea. Megachips, which saw its 2017 sales jump by 40% to $640 million, was the largest Japan-based fabless IC supplier. The lone South Korean company among the top-50 largest fabless suppliers was Silicon Works, which had a 15% increase in sales last year to $605 million. Additional details on fabless IC company sales and other trends within the IC industry are provided in the March Update to The McClean Report—A Complete Analysis and Forecast of the Integrated Circuit Industry. A subscription to The McClean Report includes free monthly updates from March through November (including a 250+ page Mid-Year Update), and free access to subscriber-only webinars throughout the year. An individual user license to the 2018 edition of The McClean Report is priced at $4,290 and includes an Internet access password. A multi-user worldwide corporate license is available for $7,290.